So most of you will know that I've started a YouTube channel. I'm uploading speed paintings, arty vlogs and tips on painting. I wanted to share with you my most recent video - 'Painting with Acrylics'. Here I build up the layers slowly using gel mediums and acrylics to create a calming ocean painting. You can see the original painting available here if you would like a closer look at what it turned out like. These videos are not necessarily tutorials or how-to videos, but I wanted to record and share with you, so you can see me working in the studio. Painting with acrylics is very different to working in oils, as the layers dry very quickly. 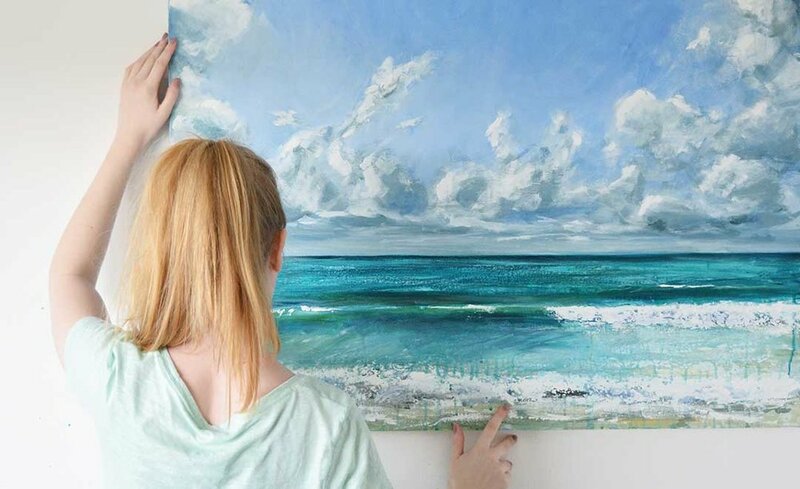 When I'm painting portraits, this can drive me crazy as I love the work-ability of oils, but with an ocean scene like this they are perfect for what I want to create. Hope you like the video and if you have any video ideas then just let me know.